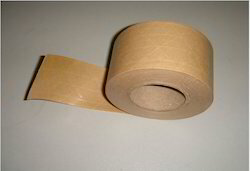 We are the prominent manufacturer and supplier of the high quality assortment of Kraft Paper Tape for Packaging Industry. Offered tape is processed using supreme class kraft paper with the help of latest technology in compliance with the set quality standards. This paper is widely used in various industries for packaging purposes. Available in various specifications as per the requirements of clients, this tape is offered at highly competitive prices.